Around our house, it’s very common to find one of us crafting or creating something at almost any point in time. 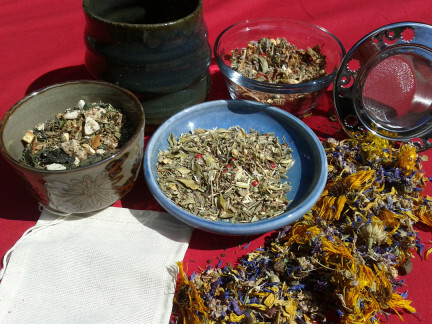 Blending up soaps and teas, knitting/sewing clothes and toys, carving spoons and turning bowls, making herbal medicine, drawing, painting, glueing, hammering….. If it’s “Do It Yourself”, we will try it (and even if it’s not, we might try it! Oy!) We just can’t help making stuff around here. So, I felt it was high time we open up a little store to showcase some of our craftiness. We’ve started small but we plan to add more herbal, knitted, and homesteading item. (I’m hoping to get Toby to list some of his beautiful carved bowls in there.) Drop in and take a look!! And tell your friends! One of the things I’m most excited about in our Etsy store is our Tea of the Month Club! There’s a 3-month, 6-month, and 12-month membership. Each month, we send out a new blend of delicious herbal tea. I’ve been working on recipes for a few months and they are all so tasty!! I’m having a problem keeping the kids out of my December blend (yes, there is cocoa in that mix)… they just keep asking for more!